Large, private and clean cabin set on 7 acres with gated access and end of road privacy. Home borders over 600 acres of National Forest with lovely views from every window of towering pines, cedars and oak trees. Many trails from property to ride or hike upon and a gorgeous lake only 1 mile away. Perfect for a quite get away to hike, bike, and visit beautiful Yosemite National Park and Bass Lake. Home has a private hot tub set up under the stars, plenty of room to ride bikes or relax. Home also has a horse shoe pit, foosball table, large hammock, shuffle board table and Cable Tv along with Wifi and Pandora. :-) Home is stocked with everything you need including books, cd's, Dvds and a large closet filled with toys and games for all ages. Bathroom has shampo, conditioner, body wash and blow dryer. This home is bordered on two sides by National Forest. Bass Lake is 1/2 mile away and we have a nice walking trail to it. Towering Pines and forest view. Home does have a portable air conditioner for the very rare days when the elevation, ample tree coverage and cooler are not enough. House has two gas furnaces as well as an electric fireplace. For guests staying 3 nights or more. Ample parking in front of cabin as well as in carport. Please bring your own washcloth. Small kitchen stocked with pots, pans, dishes etc. Large 55 inch smart Tv with top 101 cable channels, Netflix and Pandora. A closet full of toys provided. BBQ Grill on patio.. gas provided, must use lighter stick to light. Private 5 person hot tub just steps off back patio door. We stayed here for 3 nights and had a very peaceful time here. The price was very good and fair for what you are getting. The owner's were very respectful of privacy and answered any questions we had and were very accomodating. We didn't give this place 5 stars only because there were a couple of things that would have been great knowing prior to arrival and that had to do with kitchen amenities if you are cooking and not going out. We chose to stay in and not go anywhere. Bring extra foil pans to cook on (cookie sheets) so that you can bake what you need to. Other than that, we had no complaints. =) This place was a great get away from the noise of life. The set up is very cute and the place was very clean. They had plenty of blankets for cold weather and the beds were very comfortable. They have a washer/dryer available, hot tub and fire pit in a semi private area on the side of the house facing the hill. It was so peaceful watching and listening to nature. We will definitely come back here again! You will be grateful you stayed here! My daughters and I stayed here and it was just what we were hoping for... I felt very safe being just us girls. There are trails behind the cabin that we all enjoyed including our dog, Ruby. It’s close enough into town when you need food, etc. And just around 15 miles into the South Gate of Yosemite which is a beautiful drive up the 41 hwy. Inside the cabin is very cozy and well equipped. Highly recommend staying here!! Clean, quiet and comfortable lodging. Good for two guests. Nature's Retreat fit our needs for our short stay. It is close to the south shore of Bass Lake, minutes from the Forks Resort and Miller's Land. I would recommend spring or fall as best times to visit. The owners were responsive and courteous. The house is the true definition of “Nature’s Retreat” as it’s located just outside of downtown Oakhurst on private property. The comfortable bed and hot tub are bonuses after spending the day at Yosemite. Terri was great with communicating with us prior to our arrival. We would stay here again! My wife and I enjoyed staying at Nature's Retreat while visiting Yosemite. The house was perfect for our stay. We enjoyed relaxing in the hot tub after a day of hiking. Terri was helpful whenever I had a request or question. This was perfect for a couple. The kitchen is a bit small if you're into cooking though, so pack easy meals. Also bring your own olive oil! You never realize how much you need olive oil until ya don't have it! There's an area right behind the house that has trails for hiking around and they are so beautiful. Not too far off you'll find what looks like an abandoned old campground. Super cool! We hot tubbed after and it was the perfect way to relax. It felt secluded too because there's a little fence put up in the area. The owners home is somewhat near but you don't ever really notice. They are very quiet. Also their movie collection is amazing, we didn't even use Netflix. They have things like a Bluetooth speaker, a flashlight and clean tested water from the faucet that are extremely convenient. Overall, I would definitely recommend this place for a party of two, and will most likely find my way back to stay again. Bass Lake is one mile away from vacation home and is a lovely lake surrounded by tall pines. Boat rentals are availalbe, swimming, kayaking and fishing. 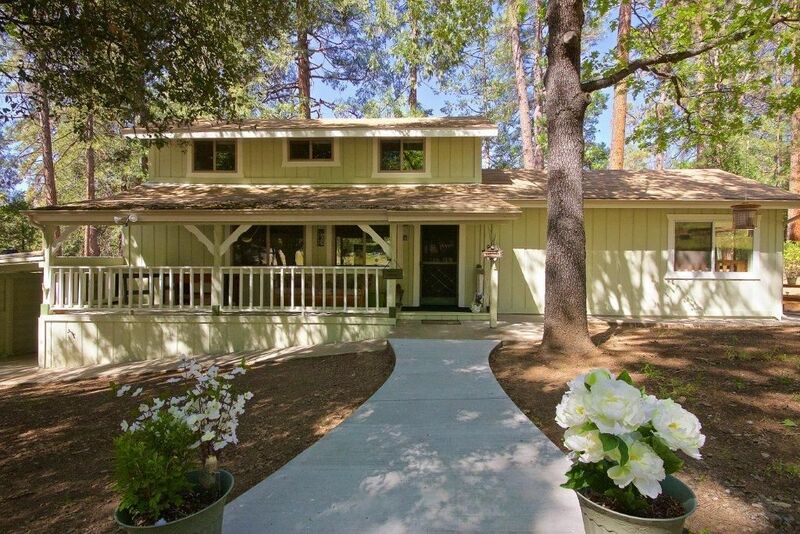 Oakhurst is 4 miles away with shopping, restaurants, movie theater, bowling and local park. Yosemite is 20 miles to entrance and on the way there is horse-back riding and a great train ride. Badger Ski Resort is 40 miles away and is very family friendly and we have a large casino with gambling, spa and many restaurants approx. 20 miles away. Lovely 18 hole golf course in Ahwahnee which is a short 10 minute drive away. All areas are surrounded by large, beautiful trees and great mountain views. Holiday rates apply for 4th of July, Thanksgiving, Christmas and New Years. Please note, my homes fees are based typically for a party of two in off season, (a couple sharing one room) as couples are the majority of travelers in off season and I feel they should not pay the same as a large party. By accepting my couples rate you agree to keep the middle guest bedroom and bath closed off and not used. If any additional guests the fee is $25 per guest after two per night. Any additional guest brought into the home without permission forfeits your deposit as well as the guest fee still having to be paid. Thanks for your understanding.